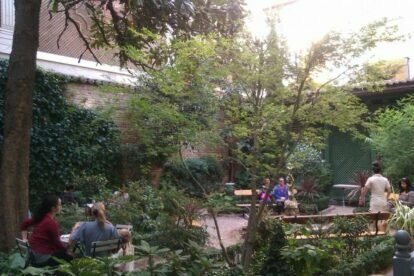 This beautiful garden is actually part of the small cafeteria at “Museo del Romanticismo” (Romantic Museum). Very few tables outside, lots of plants and trees, marble sculptures and a fountain with a few benches complete this peaceful little oasis in the city center. It is almost like a secret garden and being part of the museum makes it the perfect romantic spot. Come and take a break after you visit the rest of the museum or just come directly because you don’t need to pay the entrance fee to come to Café del Jardín. It is best during weekdays because nobody is around, and during summertime of course, when the heat is just unbearable. What I love the most about is that you can come and sit here with your favorite book for hours; you will only hear the water from the fountain and be inspired to take the best possible pictures. If your choice is to come for breakfast or a snack, try their homemade cakes and pastries; if you want to have lunch then take note of their daily menu, which is served from 12:00 until closing time, something not very common in the city. Inside the cafeteria you will feel like you’re in a vintage tea room, but being in the secret garden is what makes this cafeteria such a special place.